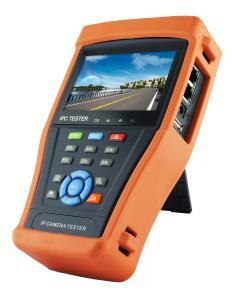 IP camera tester is for maintenance and installation of IP camera and Analogue camera ,display HD camera and analogue camera image.以Video level meter、Analog and digital video singal out、IP address search, PING IP、Port flicker、Cable scan、Digital Multi-meter、Optical Power Meter etc functions, capacitive touch screen, easy to use and operate . 6. Currently, Support ONVIF, combine with more than 20 brand camera ,such as DAHUA,Haikang,KEDA,Samsung,HIKVISION and TIANDY camera. 7. If IP camera manufacturers can offer Video Management Software that compatible with mobile phone or tablet PC, install the Video Management Software in the tester enable the tester to display IP camera image by IP camera viewer. AC/DC Voltage,AC/DC current、Resistance、Capacitance、Data hold、Relative measurement、Continuity testing . Testing speed: 3 times/ seconds,Data range -6600～+6600.